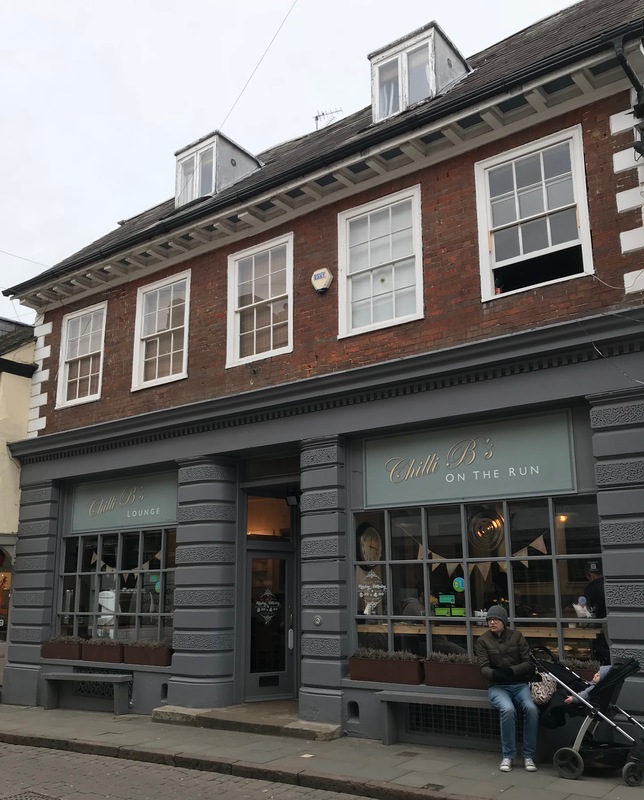 This week, my Mum and I headed to Chilli B’s for lunch, located on Bucklersbury in Hitchin, one of the streets off the main square. It is apparently a real favourite of Hitchin locals, so we were keen to give it a try. Chilli B’s has been established in Hitchin for 14 years. It’s divided into two – one side houses the shop ‘On The Run’ where you can grab food to go. Five years ago, owners Bill and Sharon decided to expand and opened The Lounge on the other side, where you can sit and relax with table service. We ate in The Lounge which is really cosy and homely. It’s an old, restored Victorian building so it has a really quirky and unique interior. Lots of great decor to look at and just a nice warm feel to it. It’s small but there is more seating towards the back, and Sharon told me that there is also an enclosed garden area that is really popular in the summer. Chilli B’s menu is bursting, and everything sounds so good. Breakfast is served until 11.30am. Even though the menu itself is really extensive – hot griddles, club sandwiches, jackets, tortillas, etc. – Sharon said if there’s something you really fancy but it’s not on the menu then please just ask. If they’ve got it in the kitchen, they’ll cook it for you! I eventually decided on the ‘Raging Bull’ hot griddle on toasted ciabatta – roast beef, cheddar cheese, tomato, red onions and horseradish. Mum played it safe with a cheese and red onion toastie. I have to say, my Raging Bull was delish! Plenty of fillings, fresh and super tasty. It also came with a little pot of homemade coleslaw. I’m not usually a big fan of coleslaw – I can take it or leave it – but this was really creamy and tasty and I ate the whole pot. It’s also always a relief to find somewhere we could potentially bring our uber-fussy four year old. There’s so much choice, I know we could find something he’d happily eat. Owner Sharon was lovely and chatty, and so accommodating. You feel like you’ve been a regular for years. You can really tell how focused Sharon is on looking after her customers and making sure they’re happy. The staff were also very friendly and efficient, happily offering advice on the extensive menu options. I can certainly see why customers stay loyal here. I think Chilli B’s is good value for what you get. My hot griddle was £6.95, and it kept me full for ages. Oh we will definitely be returning – and hopefully next time, my Mum will be a little more adventurous in her menu choice! Have you been to Chilli B’s? What did you think? Please share your thoughts below. I visited Chilli B’s in June 2016. I had just arrived from Australia and was taken to lunch by my sister’s partner Mark Davies and his mates Andy and Pete. Food was great and would gladly recommend. Thanks so much for sharing your experience Lorraine. I agree the food (and service!) is great! I used to work around the corner and couldn’t stop myself from popping in there on my lunch break, especially when it was cold out! Their Bacon Bad wrap was always a massive favourite of mine, so much melty cheese and just the right level of spice for me! Sharon is absolutely lovely – as is the whole team. The ONLY bad thing about this place is that I’ve never been able to get a seat in the lounge but its always my first choice of somewhere to grab something quick as I go by.